The Deductible Applied To Your Automobile Injury Claim! Did you know that when you or someone you know is injured in an automobile accident and they commence a lawsuit against the at-fault driver that there is a deductible they must pay out of their compensation for pain and suffering? Unlike a slip and fall accident, where there is no deductible applied to your damages, there was a $30,000.00 deductible applied to an automobile accident claim against the at-fault driver for pain and suffering. 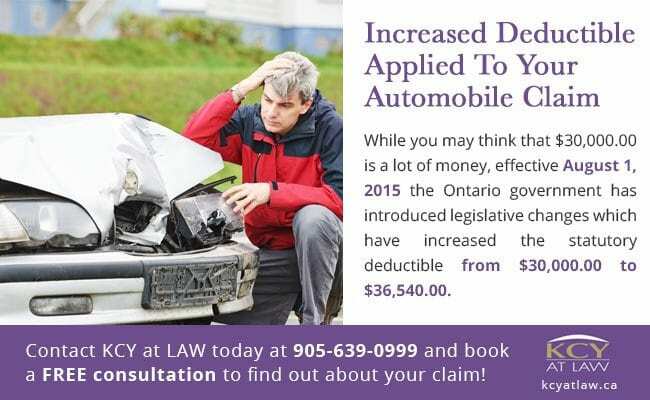 While you may think that $30,000.00 is a lot of money, effective August 1, 2015 the Ontario government has introduced legislative changes which have increased the statutory deductible from $30,000.00 to $36,540.00. This means that if your damages for pain and suffering do not surpass $36,540.00, you will not receive anything for pain and suffering. Prior to the changes being implemented effective August 1, 2015, so long as your damages for pain and suffering were not valued at $100,000.00 or greater, the $30,000.00 deductible would apply. It is only when your damages for pain and suffering were $100,000.00 or greater that the deductible was removed altogether. Now, with the recent legislative changes, your damages for pain and suffering must be at least $121,799.00 before the deductible is waived. These legislative changes are very unfortunate to those injured in an automobile accident at the hands of another and directly impact the amount of potential compensation you may get for your pain and suffering. If you have been injured in an automobile accident and are unsure as to the value of your claim for pain and suffering and/or whether or not your injuries surpass the deductible threshold, contact KCY at LAW right away! We have the experience and expertise necessary to assist you in determining the full extent of your claim against the at-fault driver and can ensure that you get the maximum compensation available. Contact KCY at LAW today at 905-639-0999 and book a FREE consultation! 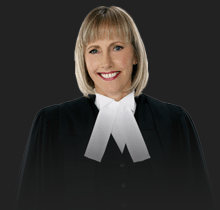 https://www.kcyatlaw.ca/wp-content/uploads/2016/01/The-Deductible-Applied-To-Your-Automobile-Injury-Claim-Personal-Injury-Claim-Ontario.jpg 200 650 Kathy Chittley-Young https://www.kcyatlaw.ca/wp-content/uploads/2018/01/KCY-at-LAW.svg Kathy Chittley-Young2016-01-13 12:24:362017-09-26 10:49:48The Deductible Applied To Your Automobile Injury Claim!